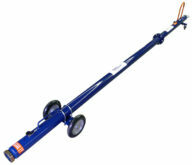 AERO Specialties steel Rx-F70/100 towbar (220,000 lbs. [99,790 kg.] capacity) is designed to perform push and pull operations on Fokker 70 & 100 regional airline turboprop aircraft. Compares to Tronair Portable & Custom Towbars with Hydraulic Wheel Assembly for F70 and F100, part numbers 01-1212-0000 and 01-1236-0000.